There has been a lot of hate and sadness in our news feeds the last few months. The shooting in Orlando shocked all of us and broke our hearts. It is hard to see such a massive attack carried out against our LBGTQ brothers and sisters on our own soil. Forty nine lives were lost in Orlando on June 12th. Forty nine people who were just hanging out, dancing and having some drinks were killed for their sexual orientation. There is nothing we can do to replace those lives, but there is one good thing to come out of all of this. We have the chance to come together and make a change. We have the opportunity to take a stand against violence, especially violence that is targeted at one particular group of people. Part of coming together is raising money and awareness. Awareness for LBGTQ rights and the bigotry that they face on a daily basis and money for the families of the victims who lost their lives in this attack. 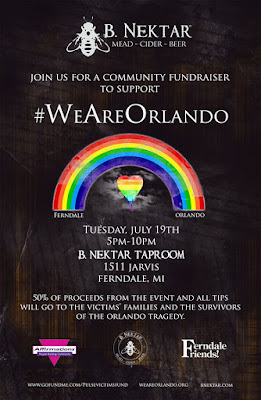 B.NeKtar Meadery in Ferndale is hosting a fundraiser this Tuesday, July 19th to raise money for the victims and survivors of the June 12th attack. The Meadery has joined forces with Ferndale Friends and Affirmations in Ferndale for this event. 50% of proceeds and all tips will be donated to the victims and families. The fundraiser starts at 5 p.m. tomorrow and run through 10 p.m. B.Nektar Meadery is located at 1511 Jarvis in Ferndale, MI. Stop by after work, grab a drink, and show your support for the LBGT community and the victims of the Orlando attacks.